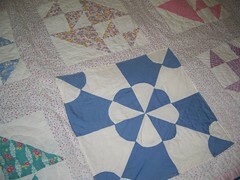 Ok, so I mentioned while at the family reunion I might have ended up with a couple of quilts….. 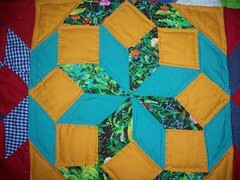 The first was loving hand quilted by my Grandmother. The bright squares? They are patches!! 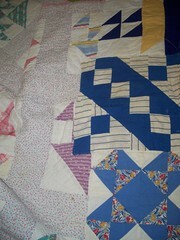 Where the quilt was worn or torn it was patched with other quilt squares…. 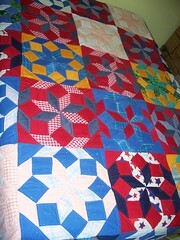 This quilt is entirely done by hand, pieced, quilted and bound…. some of it is a little shaggy, so I am planning on doing some of my own repairs. 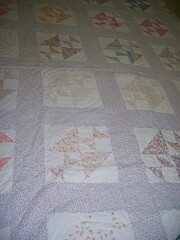 When I first got it I was unsure about that, it seemed like I would be messing with an heirloom, but now I can see that it is fully in the spirit of the quilt to have a few repairs. I don’t have a room where I can just spread this out and feel safe about it, so it will soon be on a quilt rack on the wall. Until then I get to ponder how I can show all of it that I want to. And finally, I also got this…. My suspicion is that it was a bit of “stashbusting” but I do remember this being thrown over the back of Great Grandma’s chair….This I actually feel safe using… it is most likely standard old red heart 🙂 but I know it would wash ok and it is a great lap blanket size. After taking pictures tonight, and thinking on how lucky I am to have handmade things from so many of the women that I love (I have baby quilts, blankets and clothes from my mother as well, and DH has an afghan his mother crocheted). I wonder if I didn’t have such examples around me if I would think of crafting the way I do…I wonder if I would craft…. and I am extra thankful to have such a history of talented women. It’s odd how normal you can feel around family. My neurosis are only half as neurotic. It was strange to see my parents generation though. They are all grandparents now… (or will be soon)..at one point I was playing with DS on the floor and wanted to get mom’s attention, so I called out “grandma…” only to have like five heads turn…. on the other hand none of them look like grandparents to me. I don’t know whether my own age hides things I don’t want to see or what, but I just don’t see any of them at the age they are. 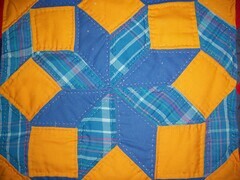 Grandma decided this year we (the grandchildren) were to have her quilts. This I totally get. Hubby though it was creepy when his grandma gave away a lot of her stuff, but it was just stuff. I totally understand why you would want to see your hard work go to someone else and know they would love it and care for it. So If I get off my fanny I will have pictures of those too. 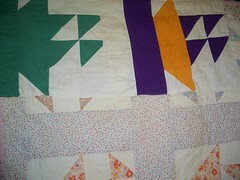 Nothing fascinates me more than vintage quilting. I don’t know of a quilter today who could tell you a quilt was an easy thing to make, and we have the advantage of machines. 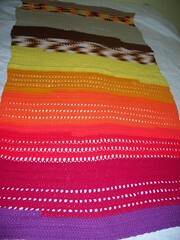 Imagine hand peicing and quilting an entire quilt….. Imagine saving sacks from the flour you bought to do it. In fact when you think of all the work that went into an old quilt, it’s almost enough to make you wonder where things went wrong. In our days of hurrying and rushing and technology many wouldn’t even consider it plausible. When I hear about sustainability and green… I think of this. I would not in a million years toss something I had worked that hard on. Never ever. Not even if it got old and ratty, I would just fix it. I certainly don’t have that feeling about the things I buy. I know for a fact that those of us who “make things” are in the minority. I often think of “disposable society” and what it means. I am not an environmentalist by any stretch of the imagination, but sometime I do feel the ache of consumption in my own home. I think that making things is part of the solution. That we as a society need to see value in what we have, and in what we are capable of. I think it will be another week or so after this post, then hopefully things will steady out. Oddly enough, no matter what I do I end up as the office mom… I often wonder why, as office moms go I am pretty crappy. I do have a good ear and the ability to keep my mouth shut though, and I am pretty sure that is what is causing the problem. Just keep your fingers crossed for me. I have no worries about my job, but it would be nice if I could break the horse in gently. In other news, I leave for Kansas on Thursday. Going back for a family reunion…. and kind of looking forward to it, although we could do without the flooding of last year. I was a touch worried we would end up in a shelter for the night, and am rather thankful we didn’t thanks to dads stellar and stubborn navigation skills. It was almost humorous how he always knew another way. In a sense that sameness is kind of cool, dad hasn’t lived there for many years and things are still kind of the same, at least the roads and whatnot. Navigating in Denver is like figuring out a constantly changing maze. I worked in the tech center for about three years, then worked closer to home for five, going back to the tech center was like going to a part of town I had never been in before. Five years now I have been here again, and still it takes some getting used to sometimes. Anyhoo, looking forward to Kansas, trying to figure out how to keep my daughter from adopting a farm kitten, as kittens there are bound to be….and looking forward to seeing everyone again, and seeing the green grass. Odd how lovely green grass looks when you are used to yellow.